Whether it is flowing in the Tennessee River, soaking into the soil or pouring from the tap, clean water is a vital natural resource. 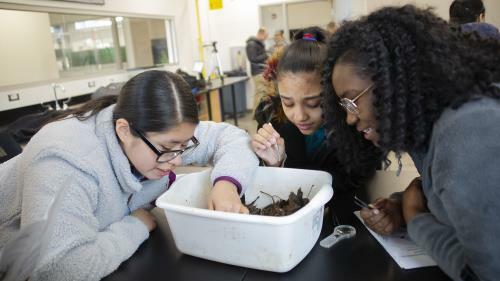 On Tuesday, 10 students from Chattanooga Girls Leadership Academy received a hands-on lesson in the critical importance of clean water to humans and wildlife during a visit to the Tennessee Aquarium Conservation Institute. The students visited as part of their involvement in a yearlong mentorship program through Tennessee American Water. The group of ninth graders took part in a variety of activities designed to show them water’s impact on aquatic life as well as their own health. 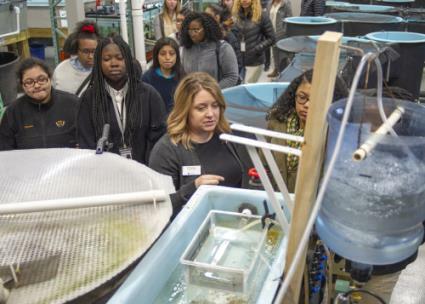 “It is important to have students see what is in the streams and rivers right in their own back yard,” said Tennessee Aquarium Watershed Coordinator Hayley Wise. “It gives them more appreciation for the nature surrounding them. During their visit, the students toured the Conservation Institute’s freshwater science facility, located on the banks of the Tennessee River downstream from downtown Chattanooga. Afterward, they had a close-up encounter with macro-invertebrates — such as aquatic insects and crayfish — collected from a nearby stream and learned how non-point source pollution can affect watersheds. Water quality and environmental compliance specialists from Tennessee American then walked the students through testing of water from multiple sources, including the river, the laboratory’s tap water and the institute’s propagation facilities used to raise imperiled species such as Lake Sturgeon and Southern Appalachian Brook Trout. 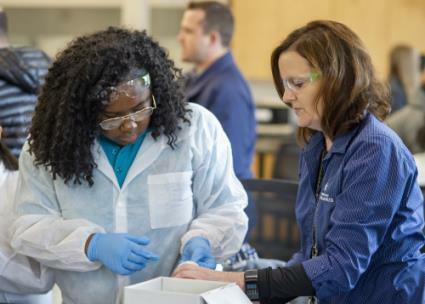 This workshop reflects the natural symbiosis of the Aquarium and Tennessee American Water’s respective missions, said Daphne Kirksey, Tennessee American Water’s external affairs manager. “We both share an appreciation and recognition of the importance of valuing our water, from natural resources to treated drinking water to wastewater,” Ms. Kirksey said. “Both organizations educate the public on the value of water and what our organizations do to protect our water but also what individuals themselves can do to assure that the water remains there for use for generations to come. By learning how critical clean water is to the well-being of humans and animals alike, the students were shown why protecting this natural resource is so important, Ms. Wise said.